DAB digital radios have become increasingly more popular in recent years and there are a lot of different products at a range of prices on the market. Finding the right radio for you can be tough and not every product on the market is flexible in terms of where you can use it and how good the sound is in different environments. My recent disappointment with the Pure Pop Maxi with Mini Moderns was proof that just because something is expensive, doesn’t actually mean it’s any good. Goodmans Canvas comes in at the lower end of the price spectrum retailing for around £29.99. The product is available in four varieties – Slate, Copper, Ruby and Steel – and it features both DAB digital and FM radio functionality. Before I get into how the Canvas performs, it’s worth noting the beautifully simple design. The product is light and small making it easy to move around the house or the office. The design is smart and subtle so it blends well into any environment and is actually rather pleasing to the eye. Setting up the Canvas for the first time is a doddle. You can either connect it to the mains using the provided power cable or insert 4x AA batteries into the back of it (note that batteries are not supplied in the box). Pressing the ‘Power’ button turns the Canvas on and it kicks into DAB mode instantly as it scans for available radio stations. On the top of the Canvas is a series of buttons giving you complete control over what you’re listening to. You can switch from DAB to FM with the push of a button, store channels with the ‘Preset’ button and scroll through channels with the ‘Channel’ button. On the front of the Canvas is a backlit LCD screen that clearly presents the channel information and tells you what song is playing. You can press the ‘InfoMenu’ button to activate the backlight and scroll through all of the channel information. It’s really simple and clear, which is exactly how a radio should be! On the back of the Canvas is the aerial, which can be stowed away if you don’t want it extended all of the time. The battery panel is on the back too and can be accessed by removing the cover. The radio gives an average of 9 hours portable use, which is fairly impressive and should give you plenty of time to enjoy the radio if you’re not able to connect it to the mains. There’s also a headphone socket on the back should you want to listen to the radio privately or use it in a crowded office scenario. Radios fail or succeed based primarily on what they sound like. The sound quality of the Canvas is quite astonishing. Despite how small it is, it produces a room-filling sound and the volume can go impressively loud. The audio is crystal clear and it’s incredibly warm. I used the radio in a large open room and a smaller compact space and it worked impressively in both. It can provide perfect background ambience for a dinner party or be used to blast out the latest hits whilst you get on with the housework. I truly have never heard such great sound quality from a product at this price point. If I was going to be picky, and this really is me trying to find a fault with the Canvas, I would say that it would be nice to have a rechargeable battery included with the radio. It’s by no means a deal breaker but it would have been a nice extra. The Goodmans Canvas is an exceptional product. From its stylish design through to its remarkable sound quality, the radio is definitely one of the best I’ve seen. The price is a definite bonus and it’s amazing to get such quality so cheaply. 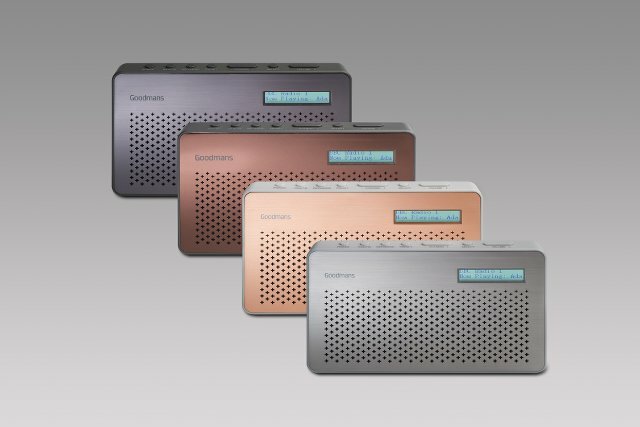 The Goodmans Canvas is a truly wonderful product that should suit every kind of radio lover. I simply can’t recommend it highly enough.